FILE - A soldier patrols the White Mountains near Tora Bora, Afghanistan, Dec. 18, 2001. Islamic State militants captured parts of Afghanistan's Tora Bora region Tuesday night, after days of heavy fighting with Afghan Taliban and pro-government militias. The remote, mountainous area contains a complex set of caves bordering Pakistan. It became well-known because al-Qaida head Osama bin Laden was cornered there by an American-led team, a few months after the September 11, 2001 attacks on the U.S., but he escaped to Pakistan. Intense fighting started in the region almost a week ago when IS militants attacked Taliban positions. Initially, the Taliban managed to repel the attack and pushed IS back. Local, pro-Afghan government militias, that would usually be opposed to the Taliban, also fought IS. It was not clear whether they fought with the Taliban or separately, and whether the two sides had a de-facto temporary truce while they fought their common enemy. IS militants, however, have not just managed to defeat both to capture Tora Bora, they have started an assault against Pachiragam, one of the 22 districts in Nangarhar province. A VOA Pashto service reporter in the area, Zabihullah Ghazi, said the attack was intense and the district may be on the verge of collapse. Ataullah Khogyani, the Nangarhar governor’s spokesman, said the situation in Pachiragam was tense but refused to share more details. Afghan Ministry of Defense spokesman General Dawlat Waziri, however, did not confirm the capture of Tora Bora. “We have seen IS activity in Chaprahar and Pachiragam since yesterday, but our forces are aware of situation,” he said, adding that he was confident the Afghan forces would “crush” IS there, just as they had previously done in the Achin district. Achin is the same district where the United States military dropped its biggest non-nuclear explosive, commonly known as the Mother of All Bombs, in April. 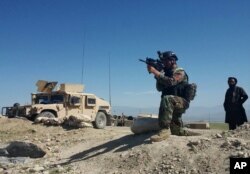 FILE - A member of Afghanistan's special forces points his gun as he observes the enemy lines in Achin district of Nangarhar province, in eastern Afghanistan April 14, 2017. Despite the assurances, local authorities severely criticized the central government, which they said failed to provide extra weapons to local militias despite promises. The VOA reporter said the Afghan government has little control on the ground in Tora Bora. Local sources say both sides suffered heavy casualties in the fighting last week but journalists could not independently confirm any details due to lack of access caused by security concerns. Hundreds of residents from Tora Bora had taken refuge in Pachiragam for fear of IS when the fighting started a week ago. With IS approaching Pachiragam, further internal displacement was expected. The Islamic State Khorasan Province or ISKP, the chapter of Islamic State in Afghanistan, Pakistan and Central Asia, initially emerged in early 2015 in eastern Afghanistan. VOA reporting on the origins of IS in eastern Afghanistan disclosed that most of the militants initially came to Afghanistan from the Orakzai Agency of Pakistan’s tribal area of North Waziristan. Initially they came with their families, pretending to be refugees displaced by a military operation launched by Pakistan in 2014. Locals told VOA they claimed to be from the Tirah Valley of North Waziristan and spoke with an Orakzai dialect. General John Nicholson, the top U.S. commander in Afghanistan, told the Senate Armed Services Committee in February that most militants in ISKP were former Pakistani Taliban who moved into Nangarhar.